Since first starting to deliver Pilates classes to others I have worked with a number of fellow professional footballers as well as industry experts who have been kind enough to endorse my capabilities and character. A sample of these testimonials can be found below. Having worked alongside Jon for the past eight years, I've seen his dedication and attention to detail at close quarters. Since Jon has taken up practising Pilates he has transformed his own physique, core strength and whole body composition. I've had first-hand experience of Jon's advice and knowledge in Pilates, with him guiding me through various exercises to improve certain parts of my fitness. On top of that I've taken part in Pilates classes led by Jon where he has worked with people of varying level of Pilates experience. Jon is always approachable, helpful and shows an expertise in his field. In February 2013 I had a double hernia operation, followed by a double groin operation in June the same year. I have been a football player for 15 years and am used to all manner of training and fitness regimes, so thought the rehab wouldn't be a problem. I was wrong, and struggled for seven months. At this time I was lucky to be playing with Jon, who suggested Pilates to me. I was sceptical, it didn't seem physical enough. How wrong I was! My core, balance and posture were all wrong, but after joining up with Jon twice a week these troubled areas have gone from strength to strength. I would go as far as to say Pilates saved my career, and Jon has been a big part of that. From working with Jon at football every day to Pilates now, I know he is as dedicated as they come with a work ethic I admire. He is someone I would totally trust with my body conditioning and fitness through Pilates. Jon's keen interest in fitness, strength and flexibility was clear to see when I was his teammate at Stevenage FC. However, it wasn't until I started to develop niggling muscle and joint injuries that I began to fully appreciate the depth of his knowledge and passion for Pilates. He introduced me to it and taught me exercises that not only helped alleviate these aches and pains but also became my injury prevention programme. He also introduced Pilates to me as the core of my strength training, and I continue to use everything that he taught me today. Jon's programme has undoubtedly improved and lengthened my football career. I have known Jon for a few years now since working with him at Stevenage FC. He is a great professional in all aspects of wanting to improve and become the best he can be. He is a polite gentleman that will go out of his way to help you. I'm looking forward to coming down and joining his Pilates classes. I have known Jon in a professional capacity for five years during our time at Stevenage FC. He is far and away the best professional I have had the opportunity to work with. Having sustained a number of serious injuries, Jon has demonstrated remarkable dedication, work ethic, athleticism and attention to detail allowing him to regain optimal levels of fitness time and time again. Jon is a fantastic individual and an absolute pleasure to work with. I have known Jon in a professional capacity for over 10 years. In that time I have worked with him on a number of his own injuries, and he has always shown a good understanding of his treatment pathways through rehabilitation and return to play. In my opinion the best therapists are those who have personnel experiences similar to those of their clientele. 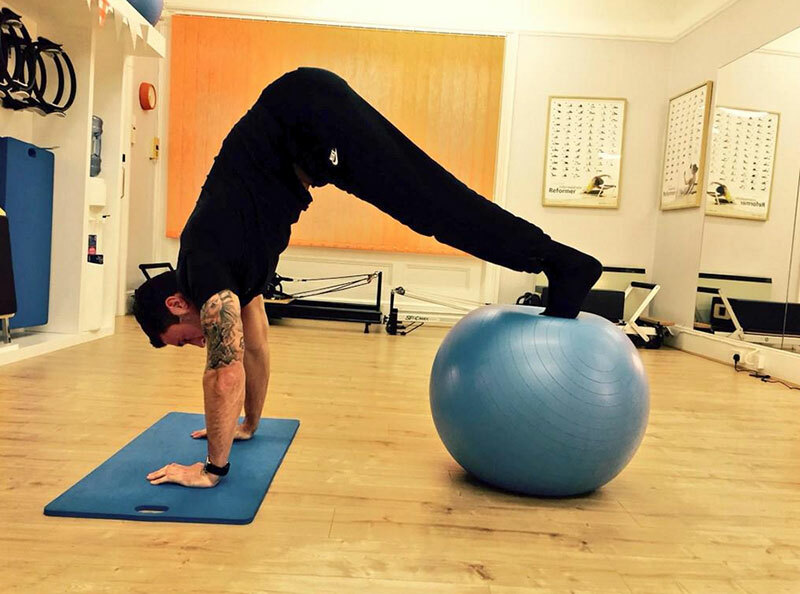 Jon certainly has that and has used sports-specific Pilates as a major rehabilitation tool at each stage of his rehabilitation and performance when back in full training. He is extremely enthusiastic and knowledgeable about his subject, and uses his own creativity and years of professional football training to tailor Pilates programmes for his clients. I have been working in high level football, rugby, tennis and athletics for 15 years and I'm excited to have Jon as a therapist to refer my professional athletes to. There is a big need for not just Pilates but 'sports-specific Pilate ' in professional sports rehabilitation, and I'm pleased Jon has taken Pilates to this new exciting level. I have worked with Jon since 2007, when I inherited him as his manager at Rushden and Diamonds FC. We enjoyed great success together, and his signing by me at Stevenage FC led to a period of unprecedented and sustained success there too. Jon is a highly disciplined, highly professional, focused and determined man. When he puts his mind to a job, that job gets done to the highest standard with Jon's sternest energy. I don't say any of that lightly. Now that he is broadening his horizons and developing new skills, I have no doubt that those that work with him in the field of Pilates will find that they have chosen to work with a leading practitioner, on the basis that Jon does not do second best in my experience; if it needs doing, he goes all in. Jon is someone I have known for seven years now. He is a great example of a winner both on and off the football pitch and is a role model in being a good pro. He applies himself and gives 100% in everything he does. I have seen his Pilates abilities grow over the years and they have enabled him to overcome obstacles such as injuries and help others overcome theirs. I'm sure whatever he chooses to do after his playing career will be a roaring success. It was an honour to play in the same team as Jon and when he was at my side he gave me the confidence to be the very best I could be. I trust him implicitly and have the upmost respect for the dedication and determination he possesses. His desire to improve away from the pitch has inspired me to develop all aspects of my game. He is a winner to the core and has that rare ability to help others reach their full potential. Jon is a total professional. His thirst for knowledge and his dedication to whatever he does shines through when you meet him and get the chance to see him work. His work in the gym with the players was invaluable and helped massively with injury prevention. He encouraged others to work on different aspects of strength & conditioning training, and often led the groups. The players enjoyed his Pilates classes and Jon was an excellent instructor. Anyone who has suffered from a prolapsed disc as I did will understand how painful and debilitating it can be. Thanks to Jon's expertise, dedication and methodical planning, he constructed a number of routines that got me back to full fitness. Working in a sporting environment with elite athletes, I now understand and appreciate the full benefits of Pilates. Since we have introduced Pilates to our training, we have seen a vast improvement to our fitness, flexibility and overall conditioning. I would highly recommend Jon and Ashton Pilates to anyone wanting to get expert training with results. I've been using Ashton Pilates for the past year, and Jon's training techniques and expertise have hugely improved my physical strength and appearance. It has also helped to improve my core and my strength which has in turn improved my overall performance as a footballer on the pitch. Jon's approach to the training is professional yet friendly making a comfortable environment for the client. I can't recommend his services enough!